This category is split into 13 pages. This is page 10. 672 Roman (20). Bronze folles AD 295-312. Includes Diocletian, Maximianus, Galerius, Maxentius, Maximinus II, Severus II and Constantius I. All very fine to extremely fine, some with silvering. 673 Roman (21). Larger bronzes of 1st - 2nd century AD. Includes Hadrian, Trajan and Augustus. Fair to fine. 674 Roman (263). 3rd - 4th century AD. Mixed lot of antoniniani, folles, Ae 3 and 4's. Average about fine. 675 Roman (29). 3rd - 4th century antoniniani, folles, Ae 3 & 4's. Most identified in cardholders. Average fine. 676 Roman (3). 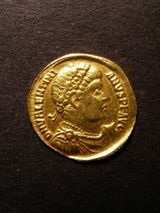 AD 282-285 antoniniani of Carinus, Numerian and Carus. All very fine. 677 Roman (3). Constans Ae centenionalis, R. Constans standing on galley, Siscia mint. Constantius II Ae centenionalis, R. soldier dragging barbarian from hut, Siscia mint. All extremely fine. 678 Roman (3). Florian AD 276 Ae antoniniani, R. Providence standing. 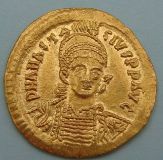 Severina Ae antoniniani. All very fine to extremely fine. 681 Roman (5). Billon tetradracm of Trajan and Nero, together with Hadrian denarius, plated Augustus denarius and Parthia silver drachm. Mostly fine. 682 Roman (51). Assorted large bronzes, 1st - 3rd century AD. Includes Nero, Augustus, Faustina and Domitian. Poor to fine. 683 Roman (6). Bronze sestertius of Tiberius, Tiberius seated left, R. S.C. Nero As, Tiberius As, Hadrian As, Greek silver of Chersonese and an obol of Massalia. Fair to fine. 684 Roman (6). Silver denari of Severus Alexander, Julia Domna, Geta, Faustina I, Hadrian and Republic anonymous issue. All about very fine. 685 Roman (72). Collection of bronze antoniniani, folles, Ae 3 & 4's, includes high grade Diocletians. Mostly fine to very fine. 686 Roman (74). Collection of 3rd - 4th century AD antoniniani, folles, centenionali, Ae 3 & 4's. Range of Emperors, a few better types. Mostly very fine. 688 Roman 1st - 4th century AD (321). Collection of bronzes. Includes Allectus antoniniani. Mostly fair to fine, a few better grades of Constantine folles. 693 Roman Bronzes (10) and early Indian Copper (31). F to GVF. 701 Roman silver denari (11). 2nd - 3rd century AD. Includes Geta, Caracalla, Septimius Severus and Julia Domna. Average very fine. 703 Roman silver siliqua of Gratian and Constantius II. Aquilia and Lugdunum mint. Both very fine. 704 Romanus IV (1068-1071) gold scyphate, weighs 2.9 grams. Christ standing facing, crowning Romanus and Eudocia, R. Michael, Constantius and Andronicus all standing facing. Sear 1861. Very fine. 705 Septimius Severus silver denarius, R. VICTORIAE BRIT, Victory advancing right. Scarce. Sear 6382. Very fine. 708 Trinovantes, Dubnovellaunos gold stater. Two crescents on wreath, R. horse left, leaf below. S.207. Good very fine, but struck slightly off centre on reverse. 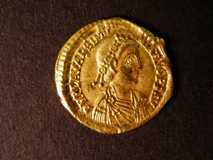 709 Valentinian I gold aureus. R. Restitutor Republicae, Valentinian standing facing holding labarum and victory. Antioch mint. Sear 4088. Very fine with a few light scratches on reverse and possibly ex mount. 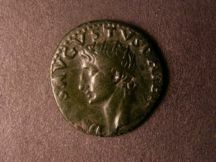 1760 Aelius Caesar (AD 136-138) copper As. R. Spes advancing left. Sear 3993. Good fine. 1762 Ancient (4) Sicily, Syracuse Ae18. Roman Republic Ae As (211-207 BC), Augustus As struck by Tiberius, Scotland copper Turner. All about fine. 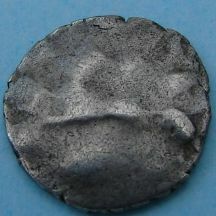 1765 Anglo-Saxon Sceat circa 680-710, series F, bust right. R. small cross on steps, annulets around. S.781. Very fine, slightly off centre. 1766 Augustus and Agrippa Ae25 of Nemausus. Heads back to back, R. crocodile chained to palm. Sear 1730. Good fine. 1767 Augustus issued under Tiberius (AD34-7) copper AS. Radiate head of Augustus left. R. eagle standing facing on globe, head right with wings open. Sear 1790. About very fine, dark patina. 1768 Byzantine (3) silver Hexagrams of Heraclius and Constantine (AD 610-641). Emperors on throne, R. cross potent on globe. All about very fine. 1769 Caracalla Ae27 of Caria, Alabanda. Obverse laureate, draped and cuirassed bust right. R. laurel branch with three sprays. Sear 2551. Very fine. 1770 Celtic. Corieltauvi Aun Cost silver unit. Remains of wreath, R. AUN COST, horse left. S.403. Good very fine. 1773 Celtic. Epaticcus silver unit. Head of Heracles right, R. eagle standing on snake. S.356. About extremely fine, dark tone. 1774 Celtic. Tasciovanus gold Quarter Stater, crossed wreath. R. horse left. S.221. Choice, near extremely fine and centrally struck. 1776 Gordian III (AD238-244) Ae Sestertius, R. Gordian standing right holding spear and globe. Sear 2499. Good very fine/very fine but with some encrustation. 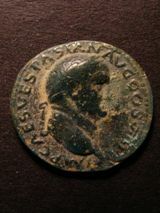 1777 Hadrian (AD117-138) copper As. R. Minerva advancing right holding javelin and shield. Sear 3679. About very fine with green patina. 1785 Roman (2). Augustus brass Dupondius struck by Caligula, R. Augustus seated left. Sear 1811. Claudius copper As, R. Minerva right. Sear 1862. Fine. 1789 Roman Republic (215-211 BC) Ae Triens. 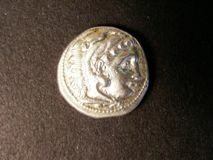 Head of Minerva right in crested corinthian helmet, four pellets above. R. prow of galley. Sear 604. About fine. 1791 Roman. Cased collection of Gordian III Antoniniani (6) all with certificates of Authenticity. Reverses; Concordia seated, Fortuna seated, Laetitia standing, Gordian sacrifacing over altar, Roma seated, Hercules standing holding club. Very fine to good very fine. 1792 Viking coinage Cnut Penny. Patriarchal cross, R. CUNNETTI small cross. S.993. Extremely fine. 735 Anglo-Gallic. Edward I silver Denier Au Leopard, 1st type. Leopard above AGL. R. cross pattée, E in first angle. Elias 18. Very fine/good very fine. 738 Celtic, Cunobelin silver unit. Draped female head right. R. figure seated playing lyre. S.314 Fine. 740 Galba silver Tetradrachm of Alexandria. Good fine. 741 Gallo-Belgic A. Ambiani gold Stater, weighs 7.3 grams. Laureate head of Apollo left. R. horse left. S.2. Fine with some minor scrapes on obverse. Small flan for type. 746 Penny, Cnut silver Penny (1016-1035). Quatrefoil type, Cambridge mint, Moneyer uncertain. S.1157. Very fine. 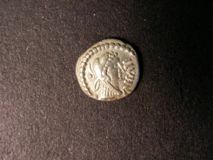 752 Roman silver Denari. All different Emperors; Antoninus Pius, Trajan, Hadrian, Marcus Aurelius, Septimus Severus, Geta, Severus Alexander, Julia Domna, Faustina Senior and Lucilla. Fine to very fine. (10). 755 Roman. Dupondi and Asses, 1st to 2nd century AD. Includes; Nero, Antoninus Pius, Claudius, Augustus and also some Greek and Indian coins. Average fine. 1129 Agrippa issued under Caligula (AD37-41) copper As. 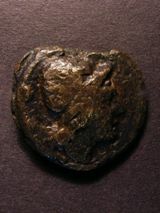 Head of Agrippa left wearing rostral crown. R. Neptune standing left holding dolphin and trident. Sear 1812. Good fine/very fine, but with scratches in the field. 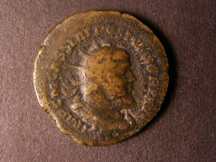 1130 Allectus (AD293-296) Ae Antoninianus. R. Providentia standing left, London mint. S.685. Fine, slight pitting on reverse. 1131 Anastasius (AD491-518) gold Solidus. Helmeted and cuirassed bust facing holding spear and shield. R. Victory standing left, holding long cross. Constantinople mint. Sear 4408. Extremely fine. 1133 Ancients (25). Roman, Byzantine and Indo Greek. Mostly bronze 3rd-4th century AD. Also includes George II 1749 copper Halfpenny. Average fine or better. 1137 Antoninus Pius (AD138-161) (2) silver Denarius. R. Annona standing left. Copper As, Jupiter seated right. Both very fine. 1141 Byzantine. Andronicus II (1295-1320) gold Hyperpyron. Bust of the virgin. R. Christ standing emperors at side. Good fine/very fine. 1142 Byzantine. Maurice Tiberius (582-602) gold Tremisses, bust right. R. cross potent, Constantinople mint. Sear 488. Very fine, over struck. 1143 Byzantine. 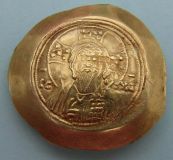 Michael VII (1071-78) gold Scyphate. Bust of Christ facing raising right hand in benediction. R. bust facing, holding labarum. Mint of Constantinople. Sear 1868. Very fine to good very fine. 1144 Caligula (AD37-41) brass Sestertius. Pietas seated left. R. Caligula standing left, sacrificing in front of hexastyle temple. Sear 1802. Fine/good fine. 1147 Celtic. 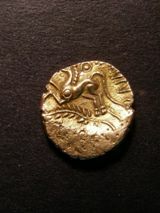 Armorica billon Stater. Head right. R. horse right, boar below. S.14. About very fine. 1148 Celtic. 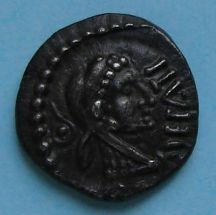 Durotriges 1st century AD cast bronze Stater, obverse 12 pellets. R. 10 pellets. S.372. About very fine. 1149 Celtic. 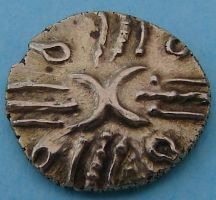 Durotriges base silver Stater. S.367. Together with Hadrian silver Denarius. R. Libertas standing. Both fine. 1150 Celtic. Gallo-Belgic E gold Stater circa 50 BC. Gallic war type. Weighs 6.2 grams. Obverse blank, reverse disjointed horse right. V.A. 56-1. S.11. Very fine, centrally struck. 1155 Drusus copper As (AD23) Bare head left. R. large SC. Sear 1794. Near very fine. 1161 Greek. Attica, Athens 5th century BC silver Tetradrachm. Head of Athena right. R. owl standing right. Very fine, slightly off centre on reverse. 1168 Hadrian silver Denarius. R. Victory seated left. Attractive very fine. 1170 Julius Caesar silver Denarius (47-46BC) Head of Venus. R. Aeneas bearing his father Anchises on shoulder. Sear 1402. About very fine. 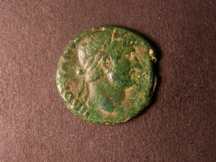 1174 Nerva (AD96-98), (2) copper As. R. clasped hands. Ae 27 of Antioch. R. SC in wreath. Both about fine. 1175 Philip I (AD244-249) Ae Sestertius (2). R. Victory advancing right. Annona standing left. Fine to very fine. 1179 Roman 3rd century Antoniniani (32), includes Gallienus, Probus, Victorinus, Aurelian, Tacitus, Tetricus and Posthumus. Average very fine. 1180 Roman 3rd century Dupondi (3) Maximinus I. R. Providentia standing. Trajan Decius. R. Genius standing. Otacilia Severa. R. Concordia seated. Fine to very fine. 1181 Roman brass Sesterti (8), includes Hadrian, Marcus Aurelius, Lucilla, Commodus and Faustina Senior. Fair to fine. 1182 Roman bronze (12) Sesterti, Asses and Dupondi, 1st century BC - 2nd century AD, includes Germanicus, Claudius, Augustus and Tiberius. 1184 Roman bronze large Folles (5). Includes Diocletian, Maxentius and Constantius I. Fine to extremely fine. 1185 Roman bronzes (169). 3rd -4th century AD, mostly Ae 3's. Fair to very fine. 1186 Roman copper Asses (2). Domitian. R, Monetas standing. Lucius Verus . R, two emperors clasping hands. Good fine to about very fine. 1187 Roman Egypt, Alexandria billon Tetradrachm (11) 3rd century AD. Includes Probus, Diocletian, Maximianus, Tacitus and Numerian. Average very fine. 1191 Roman mixed lot (9). Includes Commodus billon Tetradrachm of Alexandria, Carausius, Maximinus Sestertius. Fair to very fine. 1194 Roman silver Denari (28) from Republic to Septimius Severus. Fair to good fine. 1196 Sabina silver Denarius. R. Concordia seated left. Very fine. 1199 Trajan (AD98-117), (3), brass Sestertius. R. Trajan seated left on high platform. King Parthamaspates beside and Parthia kneeling before. Sear 3191. Copper As. R. Roma standing another with Justitia seated. All fair to fine. 84 Celtic. 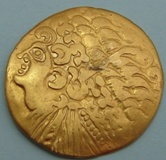 Westerham gold Stater. 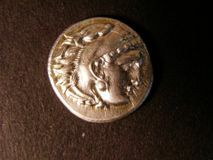 Obverse Apollo head right, reverse horse left, pellet below. Weight 6.5 grams. Hobbs no.4 VA 200-1. S.21. Very fine. 91 Greek, Thrace, Istros (400-350BC)silver Stater, obverse two young male heads facing, reverse sea-eagle and dolphin (1669).Test mark otherwise very fine. 93 Roman mixed lot (6). Includes Trajan Denarius, Faustina Senior Denarius, Theodosius I Ae2 and Macedon Ae25 time of Gordian III. Average fine. 94 Roman Republic silver Denari (4). Head of Roma, various reverses. All very fine. 95 Roman silver and bronze (6), Constantine I, 307AD bronze, Philip I (244-249) antoninianus, Trajan Decius (249-251) antoninianus Constantius II bronze (2) and Lucinius II bronze. Generally extremely fine. 99 Roman silver coins (8). 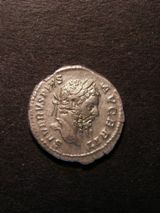 Includes Septimius Severus, Mark Antony legionary Denarius, Valerian and Geta. Fair to fine.